The phrase “Clapton is God ” originated during Eric Clapton’s tenure with John Mayall’s Bluesbreakers. Eric was a member of the Bluesbreakers from April to late August 1965 and again from November 1965 to July 1966. It was during this time that Eric first rose to prominence in the burgeoning British blues scene. The phrase “Clapton is God” was spray painted on a wall in the underground station in Islington during the mid 60’s by an admirer of Clapton’s guitar playing. Islington is one of the many boroughs of the greater London Area. The slogan soon began to appear in other areas of the city, and was made famous in several photographs … though to be honest with you, I’ve never considered Eric to be any sort of musical god. Of course Mr. Clapton has had several good albums, but on a whole, to my way of thinking, one could take all of those solo albums and create perhaps two solid discs of music that would stand the test of time. Yes, the man has seen and done it all, he was there at the cutting edge, when we first learned the power and magic music held over our lives, he’s had his share of tragedy, and had more than his due share of glory. For the most part, Eric Clapton, guitar god or not, seems to be merely going through the motions; he seems to have been going through the motions for years. 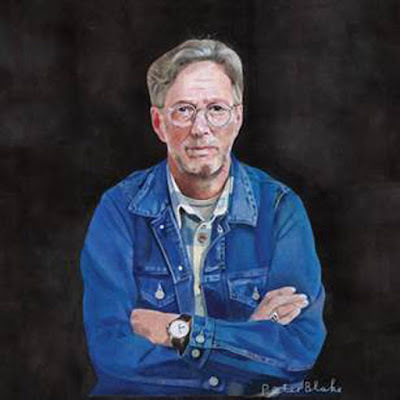 I fully understand that as an artist ages, they may no longer wish to splinter the floorboards, but this smattering of songs, along with so much that he’s done, just goes to prove the point I felt so long ago … that being, that Clapton is not God. Of the twelve songs found here, a mere four are keepers, the rest can be dismissed with the wave of a hand. Some people will try and tell you that he’s returning to older gems by blues legends like Leroy Carr, Robert Johnson, Skip James, and he even covers the Dylan classic “I Dreamed I Saw St. Augustine” … which sparks me to ask if he’s attempting to give us some sort of blues history lesson. As a body of work this album fails, as a blues history lesson it fails, even his attempt at J.J. Cale inspired songs fall far short of where they should be, which says to me that Clapton is at his best, not as a solo artist, but as a member of a group, and he’s been part of many, though why he keeps returning to solo work is beyond me, because none of those albums inspire me to even come close to thinking that Clapton is God. Mind you, I’m not asking Clapton to be trend setting, I just want him to be original and fluid without presuming that we are all going to be riveted by each note and each chord change he lays down. The work he did with J.J. Cale on “Road To Escondido” was breathtaking, a total success … yet here he is again, guitar in hand resting on ubiquitous laurels. Dear folks fronting this "It's Psychedelic Baby" blogspot weblog. Firstly, your masthead art is far too "Fabulous Furry Freak Brothers" to be considered truly psychedelic. Think Lysergic acid diethylamide, not Tetrahydrocannabinol. A tad more San-Francisco-Psychedelic-Poster-Art-esque wouldn't be altogether malapropos now would it? Secondly, I am no fan of Mr. Clapton, but papa's gotta pay the rent, don't he? Besides, if one must find one's self resting on one's laurels on occasion, one will most assuredly discover that resting upon the 'ubiquitous' variant of these laurels to be the best choice. The appellation of 'Clapton is God" had nowt to do with his recorded output - then or now - but more to his guitar prowess when articulating being bluesy in a live venue. This is why when Mr. Hendrix appeared on the scene, the live scene, Mr. Clapton's divine status was (rightfully) questioned. The Live Show was reality!